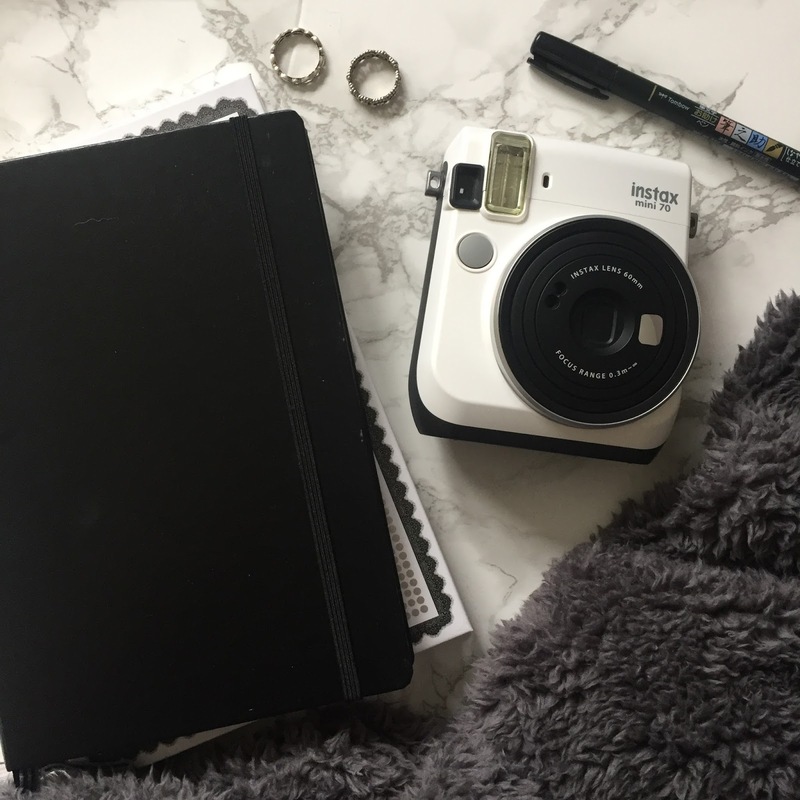 I'm so excited for this post since I've never done anything like this before (eeeek). This is going to be a full face of makeup using only one brand, oh, and it gets better, because they are one of the most affordable brands I have tried... I'm talking about Jordana, the sister company to Milani who so many know and love, but I've seriously heard no hype about Jordana. Jordana is an American brand, based in California, and they've been around for over 25 years (!! 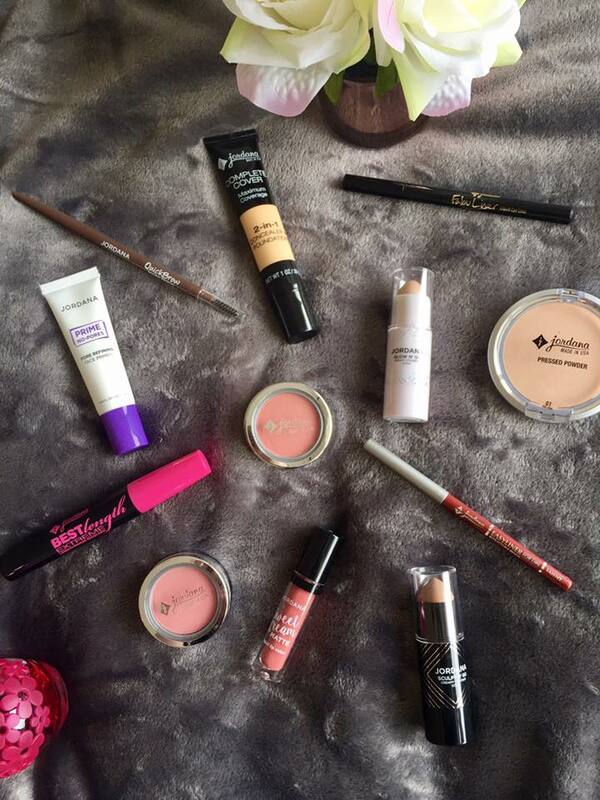 ), but now are stocked with Beauty Bay so I really wanted to get my hands on some goodies. I mean everything is priced between £4 and £7. I'm serious. Go and open Beauty Bay in another tab right now boo and get adding to that basket. Ps. This post is not sponsored, all views are my own. In total I picked up a primer, foundation/concealer, cream bronzer, 2 blushes, a cream highlight, setting powder, eyebrow pencil, eyeliner, mascara, lip pencil and a liquid lipstick for literally £60. Heck I could get 2 of those things for that price from a more expensive brand. I'm a happy gal. I'm going to tell you what I initially thought of the products when swatching and then how they worked when on my face. Yanno, walk you through it all. Now they had this primer as well as a mattifying one that would probably work great on oilier skin or anyone wanting a more matte finish, but hell nah I have dry skin for days so was all about the claims to hydrate the skin and smooth and reduce the look of redness. When swatching a bit of the primer on my hand and using it on my face, I could definitely tell it felt hydrating. It also blended into the skin really nicely; rather than just sitting on the surface, it really seemed to melt in. It also stuck to it's promise of smoothing out my skin and reducing some of the redness in my face, however it didn't completely get rid of the redness in my cheeks. I have rosy cheeks okay. Like Rudolph. But my cheeks. (Natural blusher???) I was pretty impressed with how this held up, it really did help my foundation to apply smoothly and stay on. This primer does have a scent to it though, it's almost chemically (??) which isn't the best, but it doesn't react with my skin at all and my face can be pretty sensitive, so you should be all good, I just don't like the smell. I got this in the shade 01 Fair Beige which I'm pretty sure is the lightest shade (at least it is on Beauty Bay). I noticed it had quite a thick consistency when swatching, but it wasn't moussey or gel based. 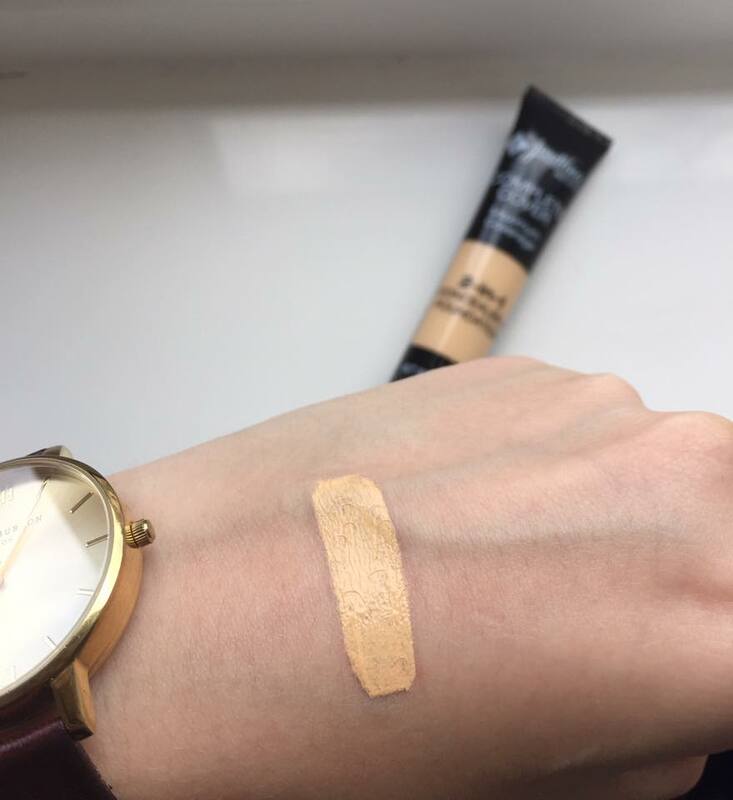 As you can see the lightest shade is not extremely pale and is definitely very yellow toned (pretty similar in colour to my MUFE HD Foundation Stick in 117 - Y225. MAC NC15 girls, this is for you. Jordana claims that it has a complete full coverage, and I think it could, if you've already got clear skin. It also has an oil free formula, evens out skin tone and blurs the look of flaws, which I can agree with! It has a satin finish I'd say, it didn't emphasise any of my dry patches which I was super pleased about - I ain't about looking dry. It did stay put for most of the day but started to fade a tinsy bit on some blemishes, but it's all cool, I didn't touch up all day. But BOY this is not transfer proof. As I said this didn't dry out my skin, but I don't think I'd recommend this for oilier skin tones, as this did make my face look dewy/slightly oily on a hot day. I didn't set my entire face as I do have dry skin so I don't like to put powder all over my face, but this just didn't seem to fully set. If you have oily skin and still want to try this out then you do you gurl, but I'd definitely say you need to set this with some powder that you trust and you know works for you. I was pretty damn excited when I saw this, I love trying new contouring products so I couldn't wait to go in hard with this bad boy. I got the shade 01 Light and it worked pretty well for me. 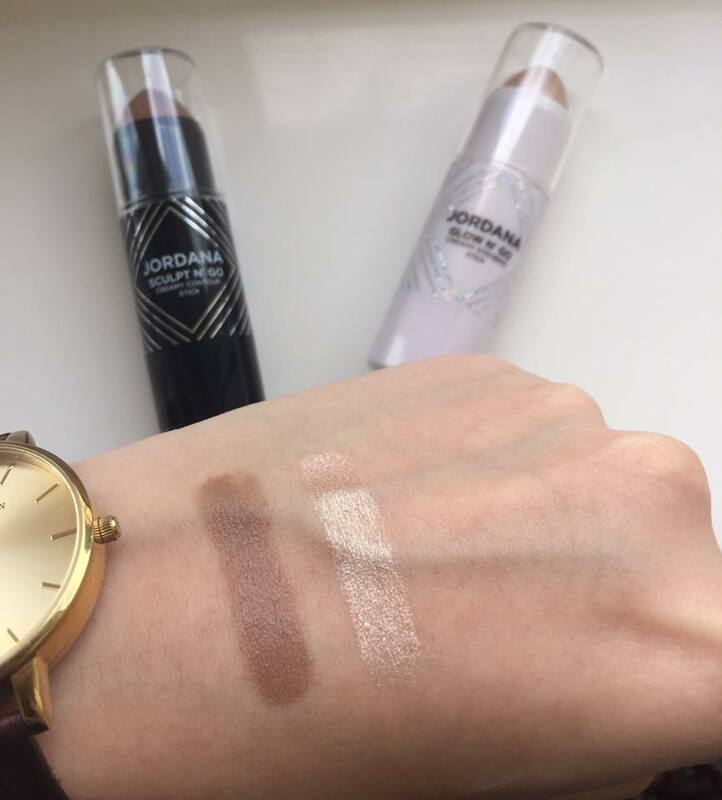 It was so pigmented and creamy it made it super easy to apply, and the cool undertone made it look natural (rather than like I'd had a bad fake tan). Seriously though, its mistake-proof, blendable matte formula really impressed me. It didn't really move around or fade during the day, and I definitely think you could build this up to be as intense or as natural as you personally like. Ahhh, highighter. I think it holds a special place in most girls' make-up bags. This strobing stick is in the shade 01 Pearl Glow and it is so frickin pretty. It has a pearly look with a bit of a gold undertone, and I was so impressed by the pigment when I watched this on my hand. It's glowy but not glittery if you know what I mean, and it had a pretty natural but still noticeable finish on the cheekbones - I patted it in with a damp beauty blender - I also tried with my finger and for some reason this just wouldn't sit completely smoothly on my skin. For me personally, I'd probably set this with a powder highlight, not only to make it more intense but because it was pretty slippery on the face, meaning it did fade/move around a little bit. 01 Natural Beige was the lightest shade available in this powder, and although it did work for me I found it to not be as pale as I thought it would be (it looked a bit more orange in person than in the swatch picture). Alas, I managed and was not disappointed when I set my foundation. Jordana says it has medium coverage, controls shine and blurs the look of pores and I've gotta say I don't disagree. It did add a little more coverage, set my face nicely and lasted throughout the day, and gave a natural matte finish. My only nit-picks for this are that it creased a little under my eye, and it kicked up a hell of a lot of powder which needed to be tapped off and blown out of the pan. Cry. 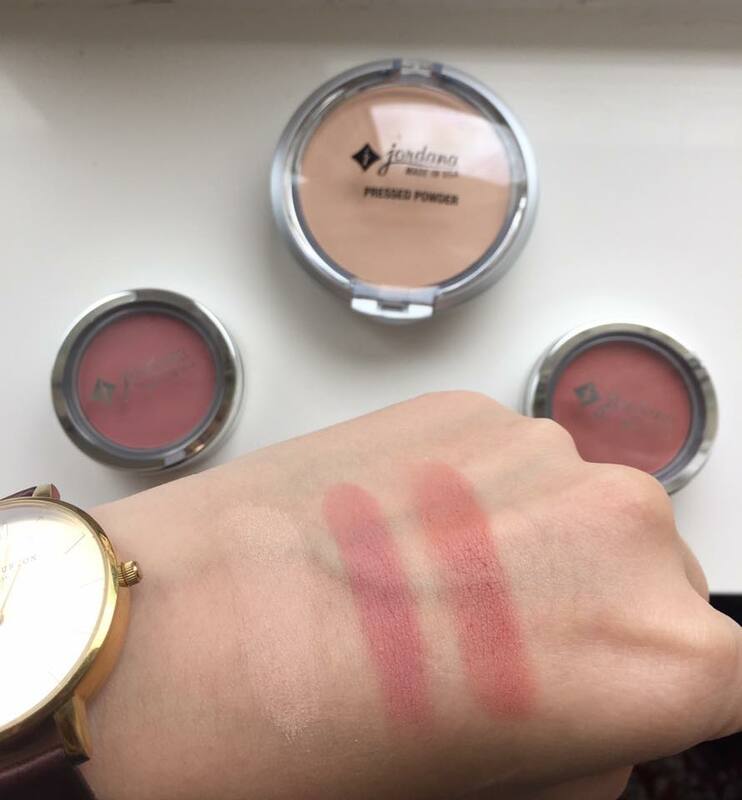 These both swatched so beautifully, they're super pigmented and smooth so you only need the smallest amount when applying it to your cheeks. 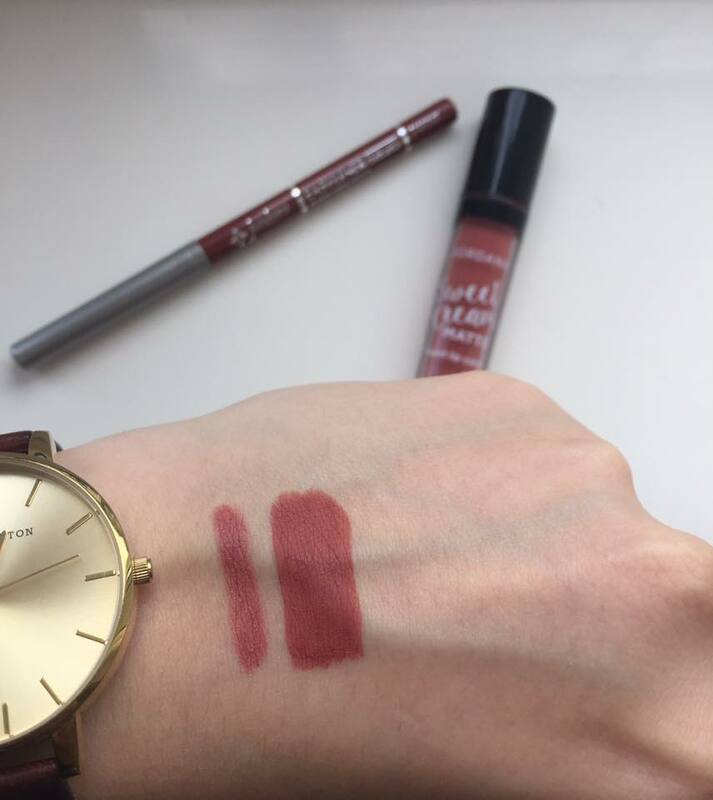 Rose Silk was completely matte whereas Tawny Beige had the slightest bit of shimmer to it, both look super pretty and I can't wait to use them more. 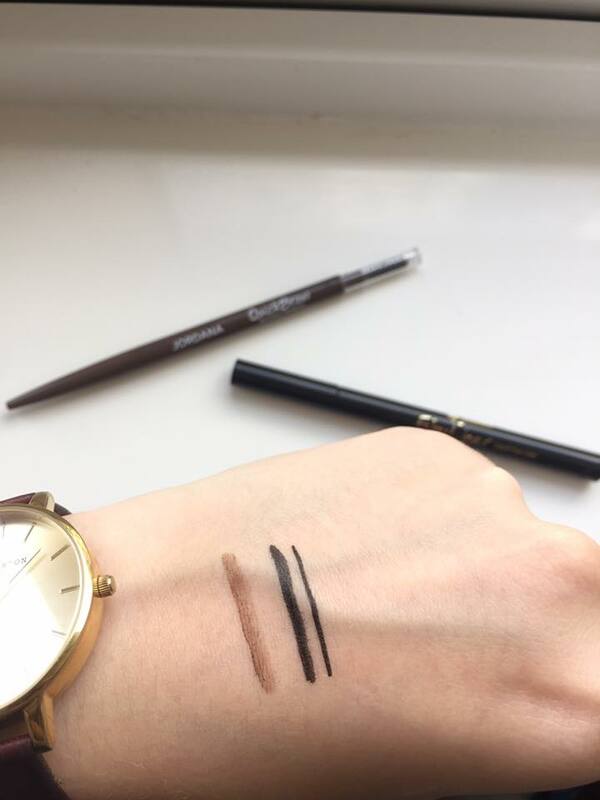 When swatching this on my hand I found that it was super creamy which was something that worried me a little, I find brow pencils that are a little more stiff work better as you can draw in more hair-like strokes rather than being easily smudgy and wiping away the product if you went over the same spot. This had an almost waxy texture on my brow after I went over the same area. The spoolie on the other end of the pencil really was my saving grace here, as after I'd brushed through my brows they were really set in place, and the product looked pretty natural as it covered and darkened the natural hairs of my brows rather than just looking like I'd sharpied over them. My brows stayed put all day (no hairs flappin' around in the wind for me) but the inner part of my brow did start to fade a tiny bit, just where my hairs are more sparse. I was able to create both thicker and thinner lines with this, although it did settle in to the fine lines on my hand with the thicker stroke - I didn't have any problems with this on my eyes though! It was pretty smudge proof which I liked, and it was quite easy to get a thin flick with no trouble. The pen style nib itself was quite stiff, meaning I had to go over some bits to blacken them as the nib had kind of started to wipe away product that was there, but it was easily fixable by going back over it and then it stayed super black. The only problem I did have however was if I had to go over the same bit a couple of times the nib did get pretty dry meaning it was a little more difficult to get a clean black sharp line. Are we shocked that just one of my pictures didn't want to work on this post? Naaaa. There were 2 mascaras I could have chosen from, this one or the Extreme Volumising mascara but I chose to pick up this one because I preferred the look of the brush. It reminded me of the Benefit They're Real! Mascara which is raved about so much I'm surprised babies aren't born into this world with a They're Real in their tiny hands. Quite disappointingly, this didn't actually separate my lashes as much as I wanted it to, and it does say it gives maximum length and lash separation. I will say it really did lengthen them though (pretty similar to how They're Real works). 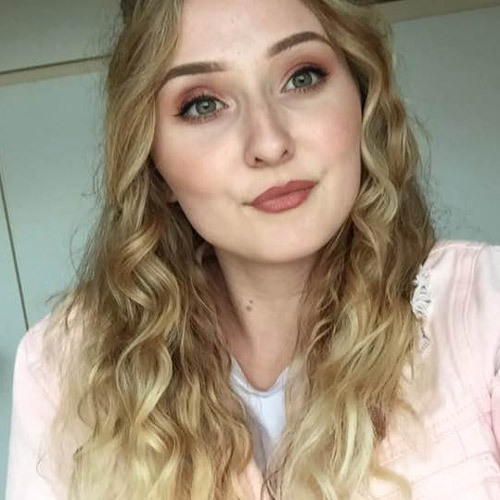 Lip products have got to be probably my hands down favourite product to try out from new brands, and these really didn't let me down. I was immediately impressed with how creamy this lipliner felt (this is the shade Tawny). It is retractable, so you don't have to worry about sharpening it! It didn't drag on my lips at all when I was applying it and the pigment was so good! Once I'd filled in my lips it did feel a little drying, but this is normal for lipliners. I mean, you're literally drawing on your lips with a pencil. Both this and the liquid lipstick are a berry/rosey brown kind of colour, I lav it. The first thing I will say about this liquid lipstick is that it is exactly as the name says. It is a SWEET cream matte liquid lip colour. This has a super strong sweets/vanilla scent to it (the name does warn you though. Literally.) The good thing is that the scent doesn't linger once you've applied it and it's set. Mine is the shade Tiramisu which just so happens to match the lipliner perfectly. A lil lip match made in lip heaven. The pigment was so good with this, I was shocked that for the price it was such nice quality. This lasted all frickin day through eating and drinking and talking (I talk a lot), and felt a little dry but nothing too uncomfortable - it reminded me of a mixture of the Limecrime Velvetines and the Colourpop Ultra Matte's.